As the flight test of NASA’s Orion spacecraft nears, the agency released Wednesday a video — called “Trial By Fire” — detailing the spacecraft’s test and the critical systems engineers will evaluate during the Dec. 4 flight. Orion is in the final stages of preparation for the uncrewed flight test that will take it 3,600 miles above Earth on a 4.5-hour mission to test many of the systems necessary for future human missions into deep space. After two orbits, Orion will reenter Earth’s atmosphere at almost 20,000 miles per hour, and reach temperatures near 4,000 degrees Fahrenheit before its parachute system deploys to slow the spacecraft for a splashdown in the Pacific Ocean. On future missions, Orion will carry astronauts farther into the solar system than ever before, including to an asteroid and Mars. 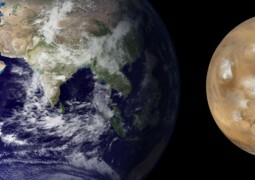 SwRI Researchers discover new process that explains massive differences between Earth and Mars.